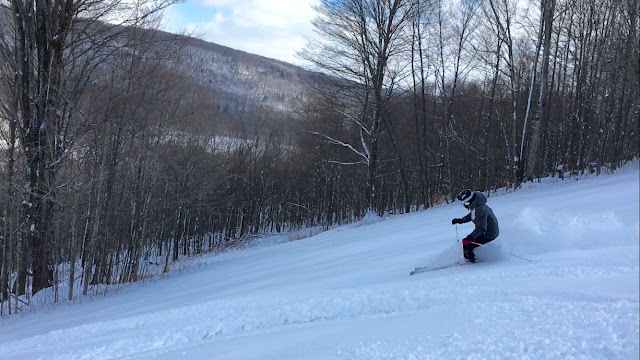 Riding the Triple at Labrador. We are on a weekend getaway to visit our oldest son Alec at Ithaca College in New York. We brought our skis but it rained pretty hard on the drive over from Maine, so our hopes for decent skiing were not high. Fortunately, we drove far enough west into the backside of the storm which was colder, and the local ski areas picked up a few inches of snow through the overnight. We ended up have a very pleasant ski afternoon at Labrador Mountain. Alec is a member of the Ithaca College club alpine race team, and Labrador was his home mountain. He visited many other mountains in the area for races including Toggenburg, Greek Peak and Bristol Mountain. 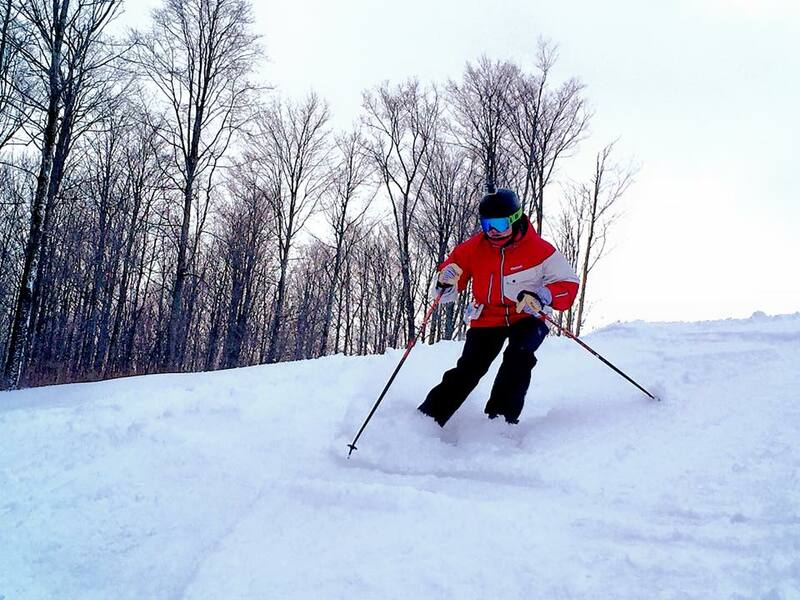 Most of the ski areas in central upstate New York are 'medium sized'. They offer around 1000 feet of vertical and most offer night skiing. While smaller in size, many (like Greek Peak and Bristol) offer high speed quad lifts. For our Maine readers, Labrador was like a "Mini Mt. Abram". Not quite as big but a similar feel with fixed griped chairs and old school feel. It is usually quite cold in this neck of the woods so snowmaking is key and they offer snowmaking coverage on most of the trails. Labrador has a roomy base lodge that was filled with kids participating in after school programs... some better behaved than others as usual! Isaac finding some powder - literally our first real powder turns of the year. It was a very fun afternoon and we were quite pleased to find some fresh snow. March is usually the best month of the year to ski. Lets hope mother nature blesses us with a storm or two back in Maine! Here is a ski edit of our day.